Put all ingredients in a food processor and process until a uniform mash or dough is formed, using a spatula to scrape the sides of the processor bowl. Use a measuring spoon to make balls of “taro root dough,” by the rounded tablespoon. Drop fritters into a frying pan filled with oil, over medium heat. Once golden on all sides, remove fritters from the oil and let cool on a plate lined with paper towel to absorb some of the grease. Cut the taro root into smaller pieces for more even processing. Viandas are a basic part of the Caribbean diet. In Puerto Rico, viandas refer to the variety of tubers or other edible roots that have been a part of our diet from the time of the Taíno natives. The taro root is one of my favorite viandas. It’s slightly sweet and the colorful, purple spots are equally appealing. This tuber is particularly popular in Hawaii’s culinary scene. While taro roots are typically boiled in salt water and served alongside a variety of other foods, their starchy texture makes them the perfect main ingredient in fritters. 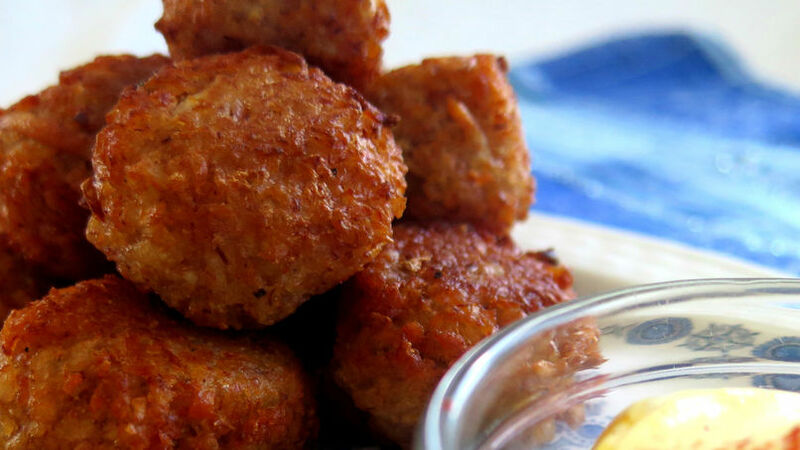 Traditional alcapurrias puertorriqueñas are the perfect example of fritters made with taro root; however, prepping the alcapurria and the stuffing can take a long time. This taro root recipe is easy to follow, and the fritters ready in a matter of minutes.